There are lots of good reasons to worry about corporations wielding too much influence, but how can anybody really want to see free speech rights restricted to individuals? Surely a city shouldn't be able to take down billboards put up by advocacy groups like the Sierra Club or Peta, or even the NRA--just on the basis of their content. Right? We wouldn't want free speech rights not to extend to groups. I don't even find it obvious that a for-profit corporation should be silenceable. Say that Coca Cola wants to put an ad on TV supporting gay marriage in Georgia--whether for ideological reasons or to sell products or to attract good staff to their headquarters in Atlanta. Or maybe they want to object to gay marriage. Should it be possible for some government entity to prohibit the ads? The critical question is whether the usual free speech rights of corporations (surely they have some) should be curtailed when it comes to elections. Is it so harmful to our democracy for corporations to run political ads right before an election that their normal free speech rights should be overridden--much like we don't let people yell "fire!" in a movie theater? Maybe, but there's a right there to be curtailed. It doesn't seem wise to completely deny the right--if we want to live in a free and open democracy. There's a further reason to be wary of restricting rights to individuals. That's bound to be interpreted as meaning "human individuals." The fact that corporations are legal entities in this country, with rights and liabilities, opens the door to other expansions. This point is made in Cass Sunstein's very interesting article "Can Animals Sue?" All around, it doesn't seem wise to insist that rights are for you and me only--that would have ramifications that are bad all around, bad for progressives, and especially bad for pro-animal progressives. organizations like Amnesty International or even the NRA represent a vision of the commmon good, corporations are interested in promoting policies which increase their profits, for their function is to make a profit. Think of prohibiting corporate free spending in elections as something like affirmation action: the common person or a group like Peta starts with a huge handicap in relation with corporate power. Making it more difficult for big business to wield that power at election times merely makes the playing field more level. Well....the NRA has tons of money, and I would deny they have any interest in the common good. Yet clearly we can't restrict their right to free speech. It strikes me as a really strange notion that a city, state, etc., should be able to take down a corporate bill board on grounds that the message is objectionable. That's what you'd get if the first amendment didn't cover corporations. So I would say--yes, corporations are covered by the first amendment. But elections are a special situation. 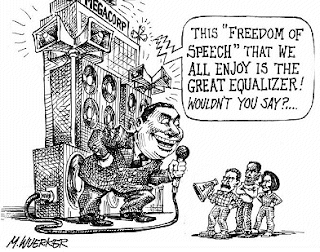 Limit corporations there, maybe, but don't deny their right to free speech entirely! From my point of view, the NRA does not have an interest in the common good either, but, as you know, they would argue that they are defending a constitutional right to bear arms and so are promoting the common good. Let's say that there are different visions of what constitutes the common good, but higher profits for Exxon is not the common good, being something that benefits only Exxon. In any case, the NRA is a non-profit institution, and corporations exist to make profits. but doesn't it seem weird to allow gov't entities to play a role as censors, even if the entity being censored is a profit-making corporation? It bothers me to think of a city taking down a billboard for content, even if the ad was put up by a corporation. No? No, it doesn't bother me. One more thing, according to Chilean law at least, a public corporation is legally responsible to shareholders to maximize profits. That, a shareholder theoretically could sue the board of directors of a corporation if their philanthropic activities could be shown to produce lower profits. Naturally, corporations generally say that whatever philanthropic activities they undertake promote good community relations, and good community relations are good for business, but the goal is always higher profits. This is not about content, and as such your concerns are an unfortunate red-herring. 1. The notion that coorporations are persons. 2. The notion that money is speech. It is specifically the combination of these two elements that makes this decision so dangerous. If money is speech then those with the most money have the most speech. This is, I hope, simply obvious. It is NOT a question "what is on the billboard" but the fact that I have 100 billboards and you have none. Such disparity is inevitable in a society such as ours, as there are of course impossibly wealthy individuals who use their money to buy influence and communicate their message. But small attempts to deal with this disparity have been made. Leaving aside for a moment the fact that this decision is, by many accounts a cherry-picked case overturning at least decades (if not 100 years) of settled law, violating the principle of stare decisis that Roberts so talked up in his confirmation hearing, the principle concern is that this will produce a slipery slope (one that we have every reason to believe that Roberts, a lifelong advocate for increasing corporate power) to the direct donation of money from corporate "persons" to individual politicians. Indeed once one accepts the core logic of the case, it is difficult to see why they shouldn't. In point of fact some of the lawyers who represented CU have already indicated that they will challenge the remaining provisions that prevent this from occuring under current law. With the current court, I don't see any reason to expect this will not go through. But let us be clear: this case is complicated and the implications will not be fully understood for some time. I recommend a thorough reading the Steven's dissent and a history of the overturned precedents before becomming cocerned with the "contents of billboards." And I can assure you this: agribusiness and not animals will be the victor here. I predict this will make veggi-libel laws look like a Sunday stroll. But why limit their free speech in elections any differently than individuals? I'm a through and through liberal, but I'm confused at the hubub here, beyond the fear that corporations are going to have fiscally conservative agendas, which I'm not entirely sure is a bad thing. I don't think Google is a terribly conservative company, and if they were to stump for a candidate, or buy advertising space on the Super Bowl supporting a woman's right to choose, I'm pretty sure the Dems wouldn't be complaining. We can't level the playing field like Amos suggests, otherwise we'd have to say celebrities that go stumping for politicians, like the many that did for Obama, would be unfair, since they wield more public influence. Heck, we'd have to say something like, all political ads would cost $1.00 and everyone is limited to one commercial that has a budget of $20 dollars, to make it truly level. Faust, What's the red herring? I am examining the notion that only individuals have a right to free speech. To say so would have lots and lots of ramifications. The ramifications are not just about money and corporations and elections. There really would be more general ramifications about speech, content, advocacy groups, etc. etc. I'm saying--let's look at the big picture before construing the first amendment that way. Wayne--yes, I'm puzzled too. I understand the people are worried about corporate over-influence, but I'm trying to think about the principles involved. There's more than one way to fix the problem and we shouldn't necessarily jump to the most drastic fix--limiting the right to free speech to individuals. Wayne: I never said that we could level the playing field; only that we could make it more level. A level playing field in a society with the unequal income distribution that the U.S. has is impossible. The fact that one or another corporation has a political stance with which you or I agree is irrelevant: legislation should establish general principles, not attempt to gain short term political advantages from political accidents, such as the fact that Google may be more progressive than most corporations. The general principle, in my opinion, is that the power of great wealth in electoral politics should be limited insofar as it is possible. Now, when I talk about a more level playing field, I'm talking about the influence of money, not of other factors, so once again that celebrities support a certain candidate or that the New York Times or Noam Chomsky does is not relevant. But more fundamentally, I don’t buy the idea that limiting corruption is a state interest sufficiently compelling to overcome the First Amendment interest in free speech. Well I do. And I think the notion that the expenditure of money equals speech is debatable. "Surely a city shouldn't be able to take down billboards put up by advocacy groups like the Sierra Club or Peta, or even the NRA--just on the basis of their content. Right? We wouldn't want free speech rights not to extend to groups." Can you give me a specific case where this type of event occured along legal lines that are redressed by the current court decision? Faust, I'm concerned with one bit of the decision--the part where the SC said that the first amendment does protect corporations. This stand is drawing all sorts of criticism. People seem to want a construal of the first amendment on which it does not protect corporate speech. Would that be a good idea? To think it, I would think you do need to think about a whole spectrum of cases, don't you? Why be limited to exactly the type of case the SC was dealing with, if the issue (that I'm concerned with) is their interpretation of the first amendment? "To think it, I would think you do need to think about a whole spectrum of cases, don't you? Why be limited to exactly the type of case the SC was dealing with, if the issue (that I'm concerned with) is their interpretation of the first amendment?" That's the thing about supreme court decisions, they exist within a specific legal context, involving precedent, the opinions of previous courts, and so on. Thus one of the reasons that people have a problem with this decision is precisely its relationship to the history of decisions made along these lines. Now of course that tradition isn't sacrosanct. But it is a specific complaint that has its own justificatory structure. But I get that's not your central interest, and frankly it's not my primary concern either (just to wade into the issue requires extensive study). I only bring this up because of your comment that you are "puzzled" by the reaction. But there have been many reactions, and many of them have to do with the nature of this decision relative to precedents and the precedent it itself sets. For my own parts I simply don't care about institutional speech the way I do about the speech of individuals. Institutions are large machines. As far as I'm concerned we (the people) can do with them (e.g. structure them and their relationship with the rest of society) what we please. Giving large machines, particularly machines the primary purpose of which is to generate profits, a "voice" is not something I care to defend. That doesn't mean we have to give them no rights, I just don't think the rights structure should be tied to the same rights structure we give to people. Indeed, I've seen arguments that current law gives corporations the best of both worlds: many of the rights of people, and many rights that people don't have due to the fact that they do not, for example, die. I think the harm that will come of this decision vastly outweighs whatever good it will do (I don't think it will do any good). But we shall see. I suspect in 5 years or so it will become manifestly clear what has been done. On the other hand there will be attempts to mitigate the damage through additional legislation, so it's going to be a fight. Yes, the reactions have to do with lots of things, and some are very reasonable. My husband and I have been arguing about this case for days...so (just in case he's reading) the other side REALLY IS REASONABLE. No...it really is. I haven't read the opinions and don't have the legal expertise to get into all the details, but I do get it. I'm just wondering about the first amendment and what it would be like if were always construed as pertaining to individuals only. You got it! I love the title--not my doing, by the way. Someone at TPM came up with it. The answer isn't quite "absolutely nothing" as the raw food we had was good for the taste buds (and intriguing, too). I can't quite see being a full time raw-foodist.